With some of the Western Hemisphere's best high altitude climbing, you can't beat Bolivia for refining your mountaineering skills! These programs are suitable for climbers in excellent physical condition with solid Mt. Rainier type skills (crampons, ice axe, and roped glacier travel). 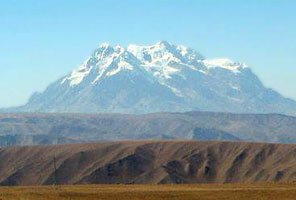 If you have a Himalayan Peak in your sights for the future, Bolivia is a great training ground. With their high altitudes, the mountains bear a striking resemblance to the rugged peaks of the Himalaya. From Ama Dablam to Cho Oyu, Lhotse, or Everest  if one of these is your goal, these mountains are great training. Our expedition begins with a couple nice training climbs in the Condoriri area of the Cordillera Real mountains, with a climb of Pequeño Alpamayo (17,482'). Then, we head over to Huayna Potosi (19,974'). These are excellent climbs, requiring a variety of snow and ice climbing skills. If you have the time, take advantage of your acclimatization by adding the higher and steeper Illimani (21,200'). The Bolivia expedition is organized by IMG Program Director Greg Vernovage, assisted by our IMG Bolivian guides (trained by Carlos Escobar, one of the most experienced Bolivian climbers). Our IMG Guides in Bolivia have climbed high peaks around the world and will train you for all the technical skills needed to have a successful attempt on these great mountains. With our top-quality accommodations in the city and camps, and great guides, the Bolivia trip is about as good as it gets for combining fun travel and challenging high altitude climbing. We are looking forward to doing it again this year! Bolivia's mountain scenery is spectacular, Indians colorfully adorned, and ruins thought-provoking. Llamas and alpacas graze on the hillsides and around camps. We may even see a condor! It has been called the Tibet of the New World. And like Tibet it has a grand history of civilization. Ruins of the prominent Inca and Amayra Peoples still stand, and many still live by the lessons in farming and ranching developed and taught by their ancestors hundreds of years ago. This country also seems to be the land of the "highest," claiming the highest commercial airport, highest capital city, and the highest navigable lake in the world! At an altitude of 11,900 feet La Paz nests in a gigantic bowl 1600 feet below El Alto, the city's international airport. The mountains of the Cordillera Real (Royal Range) rise sharply towards the sky in the background and are as striking as any to be found in South America. Getting off the plane at 13,000' will be a bit of a shock as you start hauling your duffels around the airport. You will quickly be reminded that you are at altitude. One of the most critical factors determining our success in the mountains of Bolivia will be our ability to acclimate well. While acclimatizing, there is plenty to do and see while in La Paz. An afternoon will be spent introducing you to the unique city. We'll spend time wandering through colorful outdoor markets where the local people sell everything from fruit and vegetables to antiques and musical instruments. If you like, you can even outfit yourself with a few charms from the Witches Market, "guaranteed" to bring you health, wealth, and happiness. Our visit to Bolivia wouldn't be complete without a trip to Lake Titicaca. We'll lunch on freshly caught trout and charter a small boat to take us out to the Island of Suriki (Sun Island) where we will visit the Amayra Indians who helped Thor Heyerdahl build the famous reed boats Ra II and Tigress for his exploratory expeditions. Our overnights will be at Copacabana, a beautiful lakeside resort. After our acclimatization, we are ready for the mountains! For both trips, we will go to the Condoriri area, where there are a number of good training and acclimatization climbs including Pequeño Alpamayo (17,482'). After several days of training and acclimatization climbing, we head to Huayna Potosi (19,974'). These are very rewarding climbs which require the use of fixed lines and running belays, as well as solid basic snow and ice climbing skills. After our ascents we'll return to the Base Camp Refugio. The next day we will head to La Paz for a good meal and a night at the hotel. For our Huayna Potosi climbers, we offer Illimani as an extension. This is a more technical climb, which is suited to climbers with additional acclimatization under their belts. For Illimani we drive east, over a high pass to a village where we'll load the bulk of the gear onto a few pack animals and begin our hike into base camp at about 15,000 feet. The next day, we'll hike from base camp to our high camp, Nido de Condores (the Condor's Nest) perched at 18,000 feet. The route from base camp will take us onto a rock ridge and involves some very minor rock scrambling. The Illimani summit day sees the team climbing a narrow snow ridge. After the ridge, the team faces the headwall. This is a steep climb at over 20,000 feet. This section demands our attention, presenting some exposed climbing using running belays and fixed lines, with a classic finish along the ridge leading to the summit of Illimani. Following our ascents, the team will return to La Paz for a final night. Members are free to leave the next day (many flights to/from USA arrive/depart early in the morning). I'm just not sure how to express how great it all was!... I don't think it all could have gone much more smoothly! As I've come to appreciate from past IMG expeditions, the logistics, staff, and team members on this IMG trip were as good as ever before, and you guys delivered another once-in-a-lifetime experience. I was able to see another country, meet some great new climbing partners, and also accomplish some cool things for myself. I climbed higher and camped higher than I have before and did some really challenging climbing along the way. Thanks for setting up the experiences in Bolivia. I look forward to more excellent adventures with IMG!